Should Kavanaugh be confirmed if we don’t know who is telling the truth? That’s the title of the final installment of my trilogy in The Hill on the Kavanaugh hearings. After Christine Blasey Ford’s testimony, there seemed to be a consensus — including even Republicans — that Ford was credible and that Brett Kavanaugh’s confirmation was in serious trouble. She was respectful, soft-spoken, calm, and tried to be helpful. She did not interrupt anyone and did not argue with the Senators. Republicans were hoping that she would come off as unsure, politically driven, or even unstable. She came across just the opposite. She was “100 percent sure” it was Kavanaugh, she never mentioned politics, and she came across as likable. President Trump was reportedly upset that Republicans were caught flat-footed by just how credible Ford was. Then came Kavanaugh. He strode in holding his wife’s hand. She and his mother sat behind him as he began his opening remarks. His demeanor was the opposite of Ford’s — angry, indignant, and emotional. He interrupted the Senators and argued with them. Although very different than Ford, his demeanor was also effective and seemed to reinvigorate his supporters, who during the lunch break had been feeling defeated. He forcefully said again and again that he was 100 percent innocent. Energized Republicans took over the questioning from the prosecutor they had planned to let run the proceeding. The nomination, on life support after Ford’s testimony, seemed to be very much alive. But what now? It seems we are in no better spot than when we started Thursday morning in terms of figuring out what happened 36 years ago: Those who believed Ford still believed Ford, and those who believed Kavanaugh still believed him. The news cycle on the pending Brett Kavanaugh nomination is minute to minute. Despite the many moving parts, Kavanaugh has adamantly denied the accusations even as they continue to come in. Although some Senators have locked themselves into a position of either believing Kavanaugh or of believing his accusers, there are still some who want to see how the hearing plays out. For those open-minded Senators and for those of you who haven't made up your mind yet, below are five simple guidelines to help you judge the credibility of the witnesses who testify. Did the witness have the opportunity and ability to accurately observe the things he or she testified about? Here, Republicans will question Ramirez about how much she had to drink and whether she can accurately say what really happened. As for Ford, Republicans will also question her about how much she had to drink at the party where she admits that everyone had at least one beer. Regarding Kavanaugh, there are reports that he was a heavy drinker in high school and college, and Ford says that he was "stumbling drunk" at the party. Democrats are sure to question him about these claims. Will the Kavanaugh hearings go forward this Thursday and can they be fair? The news is happening so fast that it's hard to keep track. We have Ronan Farrow, Michael Avenatti, new accusers, 30 year old calendars, yearbook entries, and on an on. "[W]e’re going to have to law the heck out of it." There’s no easy way around it. We’re just going to have to science the heck out of this case. * And when we’re done with that, we’re going to have to law the heck out of it. Defendant-Appellant Jason Alexander Phifer was convicted of possession with intent to distribute a controlled substance, in violation of 21 U.S.C. § 841(a)(1) and 21 U.S.C. § 841(b)(1)(C). The substance involved was ethylone. But as it turns out, ethylone constitutes a controlled substance—and Phifer was therefore convicted of an existing crime—only if ethylone is a “positional isomer” of butylone. Phifer says it’s not. To support his position, he urges that “positional isomer” means what he characterizes as the scientific term of art. The Drug Enforcement Administration (“DEA”) disagrees and contends that its regulatory definition of “positional isomer” governs, and even if it doesn’t, ethylone is a positional isomer of butylone under other scientific definitions. If the DEA is right that the regulatory definition necessarily governs, Phifer’s conviction stands. But if not, we must set aside Phifer’s conviction. After careful consideration and a crash course in organic chemistry, we conclude that the DEA’s regulatory definition of “positional isomer” does not unambiguously apply to the use of that term as it pertains to butylone and ethylone in this case. We therefore vacate Phifer’s conviction and remand for further proceedings consistent with this opinion. *We paraphrase Matt Damon’s character, Mark Watney, from The Martian (2015). See The Martian Quotes, IMDb, https://www.imdb.com/title/tt3659388/quotes (last visited Sept. 20, 2018). The movie, in turn, was based on the book of the same name by Andy Weir. The opinion takes a dive into chemistry and even has pictures. I would appreciate any feedback on the article. Chief Judge Moore swore in Ariana Fajardo Orshan on Monday. In her remarks, she thanked Ben Greenberg and said he would be staying on as First Assistant. In other news, there is talk about letting Dr. Ford’s lawyer (Debra Katz) question Judge Kavanaugh at the hearings next week before the Senators get their chance to grandstand ask questions. It’s an interesting proposal. I wonder whether Judge Kavanaugh’s lawyer (Beth Wilkinson) would get to ask Ford questions as well. I like the idea of having the lawyers ask questions instead of the Senators, who don’t know how to ask real cross-like questions and are not really interested in getting out what happened as opposed to making different political points. If you were able to cross either Ford or Kavanaugh, what questions would you ask? Remember, the other person in the room, according to Ford, was Mark Judge, and Mark Judge seems inclined to corroborate Kavanaugh, but Judge is on record as a having been "completely annihilated" in high school. Here is the entire agreement. 1. The Government believes that the sentencing guidelines yield a sentence of 210-262 months, even after acceptance of responsibility. That means that if Manafort had gone to trial and lost, the prosecution would have suggested that the guidelines were higher than 20 years for the 69-year old. 2. The agreement limits the sentence to a maximum of 10 years. If he successfully cooperates, that sentence will be greatly reduced. If he gets 40-50% cooperation credit, he wil be looking at 5-6 years. If he can convince the Virginia judge to give him a similar sentence and those sentences are run concurrent, he would be released in the 4 year range. He would get credit for the time he has been in. 3. The Special Counsel agreed not to bring any other charges. But this does not bind any state prosecutors (should there eventually be a pardon). 4. The guidelines as set forth in the agreement say that the laundered funds were in excess of $25 million, it involved sophisticated means, he led 5 or more criminal participants, and that he obstructed justice. Interestingly, Manafort carved out the ability to argue that he was not the leader of 5 or more criminal participants. 5. Manafort agreed that he would not profit off of this case through books, speeches, and the like. (As an aside, there is a debate in the law about whether this provision is enforceable). This isn't Page 6 material, but for SCOTUS gossip fans, it's fun stuff. First up is Notorious RBG who gave a speech yesterday. Lots of reports about how she said the confirmation hearings need to go back to the way they used to be. But the great line was that she can do more pushups than anyone on the Court other than Gorsuch "who rides his bike to work" or "possibly" the Chief. Love it. Next up is SCOTUS nominee Brett Kavanaugh. After the hearings last week, the Dems submitted lots of written questions. There was a whole section about gambling as there have been lots of rumors about him playing cards, dice, and sports. One specific set of questions centered around an email about a dice game. He answered that he did play dice, but not for money. Justice Kagan is in dialogue with Dahlia Lithwick at Hannah Senesh Community Day School in Brooklyn tonight. I'll be tweeting. It's official. House Fajardo takes the throne on Monday. If you could have one policy change at the USAO, what would it be? Please make your request in the comments, and do so respectfully. He really doesn’t like it. 5. That our now-35-year-old decision in Rabun—which invalidated a cross situated in a state park and, in so doing, summarily dismissed “historical acceptance” as a reliable guide for Establishment Clause cases—is irreconcilable with intervening Supreme Court precedent. 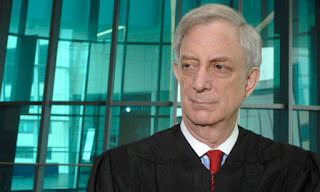 I am very pleased to announce that the South Florida Chapter of the Federal Bar Association will be honoring Judge Alan Gold with the "Ned" Award, named after our beloved Edward B. Davis. The Annual Awards and Installation Dinner will be held at the Four Seasons Hotel, Brickell, on Thursday, October 11, 2018, at 5:30 pm. You can purchase tickets here. Judge Davis would have been thrilled that Judge Gold is receiving this award. Gold is a UF grad and then attended Duke for law school. He served as a state judge and then President Clinton nominated him in 1997 to fill Jose Gonzalez's seat. He took senior status in 2011. Judge Rosenbaum filled his seat. 1. New U.S. Attorney Ariana Fajardo Orshan has been confirmed. She will be taking the reigns shortly. 2. District judge nominees Roy Altman and Rudy Ruiz have not yet been set for final hearings. That may happen sometime in October. The other nominee Rodney Smith has not yet had his initial judiciary committee hearing so it is unclear when he will be confirmed. The other two open slots remain open and there is no pending action on them. 3. The magistrate judge committee will be interviewing 15 candidates for two slots on October 1. The district judges will then vote on the slate at the judges' meeting on October 4. 4. There is one constant in the District, Federal Defender Michael Caruso. So you wanna be a magistrate judge? We will have two new magistrate judges in the beginning of 2019. The magistrate judge committee is set to interview 15 of the applicants.